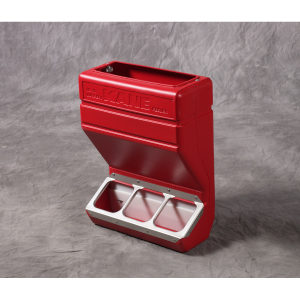 Feeders | Kane Manufacturing Company, Inc. 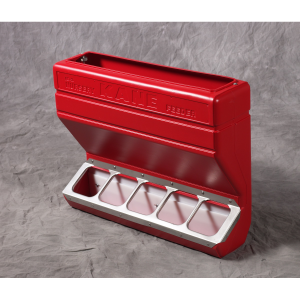 The KCF-SQ Kane Creep Feeder is designed for starting baby pigs on starter feed and used until weaning. It can be used for any dry feed materials, such as ground feeds, pelletized feeds or powder additives. 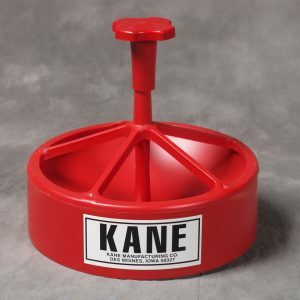 Kane Snap Feeders are designed to feed baby pigs dry food while still in the farrowing crate. 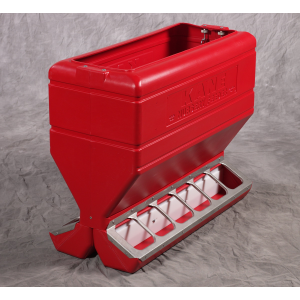 The 2 3/4" Low Profile Model, KSF-LP, is utilized by producers who early wean and provides easier access for younger pigs. 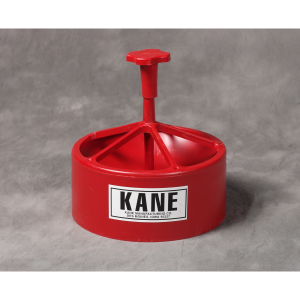 Kane Snap Feeders are designed to feed baby pigs dry food while still in the farrowing crate. The standard model, KSF, is 4" tall. 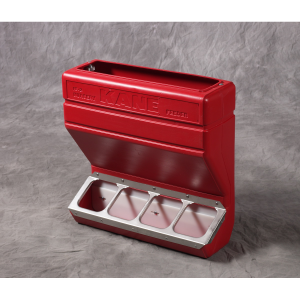 The Kane Heavy Duty Creep Tray only needs to be used for 3 or 4 days, then use the Kane Creep Feeder KCF-SQ. These Creep Trays are heavy duty so they can be used in early wean pens as well. 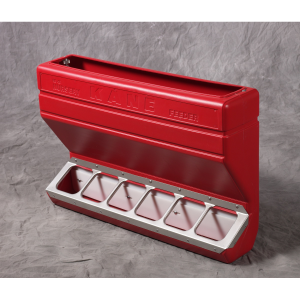 Kane 12- Hole Nursery Feeder. Kane PNF and DPNF Nursery Feeders are made of high-density, durable polyethylene with 304 stainless steel grills. 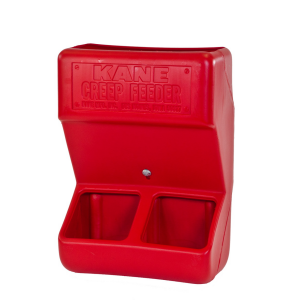 Kane 3- Hole Nursery Feeder. Kane PNF and DPNF Nursery Feeders are made of high-density, durable polyethylene with 304 stainless steel grills. Kane 4- Hole Nursery Feeder. Kane PNF and DPNF Nursery Feeders are made of high-density, durable polyethylene with 304 stainless steel grills. Kane 5- Hole Nursery Feeder. Kane PNF and DPNF Nursery Feeders are made of high-density, durable polyethylene with 304 stainless steel grills. 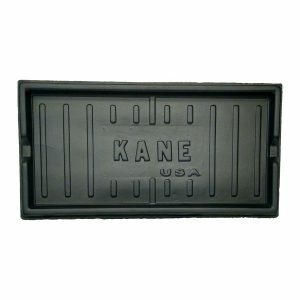 Kane 6- Hole Nursery Feeder. Kane PNF and DPNF Nursery Feeders are made of high-density, durable polyethylene with 304 stainless steel grills. 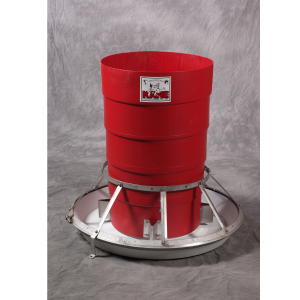 Kane Rotary Feeders are designed for extra feed savings in automatic feed filling systems and hand filled operations. Manufactured of the highest quality materials for many years of service in the pig industry through out the world. 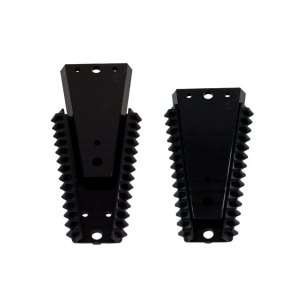 The KCF Plastic Bracket is a mounting bracket which allows the producer to place feeder in and out of the pen for easy cleaning and filling.